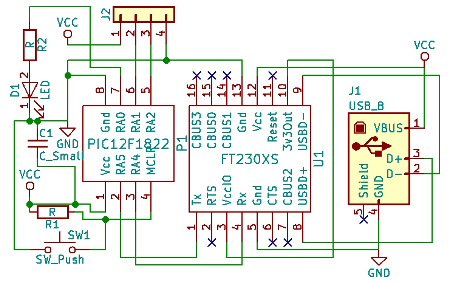 This is a USB-based I2C master which is derived on my earlier prototype Serial-I2C adapter. I normally use the Robot Electronics USB-ISS I2C adapter for test purposes requiring a PC-controlled I2C master, and development of my original RS232-driven I2C adapter was a response to problems the USB-ISS had working with Cypress I/O expanders. Since then I have noticed that the USB-ISS having problems in other situations that the Serial-I2C adapter was fine with, so decided to create my own USB adapter. To be fair the problems with the USB-ISS could well be down to use-and-abuse damage, but my own I2C adapter is more in tune with my use-cases — the main thing is the much more detailed response codes in error situations, which are intended to aid debugging, and the exclusion of non-I2C functionality negating the need for any setup. The command protocol is also intended to more accurately reflect the underlying I2C transaction, in order to aid the quick tracking of problems. When I was experimenting with the Cypress I/O expanders, I created a make-shift bread-board circuit that needed just a single USB connection, rather than an external power supply and an RS232 converter cable, and this is shown below. The PCB is basically a size-reduction of this make-shift setup, due to the inconvenience of taking it with me when I last went back to the UK. The circuit schematic shown below is a direct copy of this make-shift setup, the most notable omission being any form of on-board pull-up resistors on the I2C clock & data lines. The I2C-RS232 breadboard included receptacles for interchangeable pull-ups but I found these to not be of much use in practice, and thought it best to simply leave pull-ups to the external circuit. The reset button and activity LED were not really required, but I decided to include them anyway to maintain the functionality of the original breadboard. The PCB layouts is shown below, where red tracks are on the top layer and green ones one the bottom layer. What is immediately noticeable is how close this board is to being single-layered, with only four tracks on the bottom layer, but eliminating all of them would be difficult. In any case it would be moot since there is no fab cost savings in having just one layer. Most of the tracks are far thicker than they need to be, but in this circuit the space tracks take up is not really an issue. In hindsight the third revision was probably not necessary, as indications are that I had a bad batch of USB-UART interface chips, rather than problems with electrical contacts. The Gerber files for this third revision PCB are available in the download section of the Bitbucket repository, and most fabs will take the zip-file as-is. It is however made available without any warranty. A while back I ordered in a PIC16F1454 (Farnell 2305809) which included USB support, but it was pretty clear that utilising this USB support would be a major project. The data-sheet section starts out by stating that a background in USB is expected, and the next page lists the fourteen registers used to control the USB module. The subsequent 25 pages are dotted with USB terms such as single-ended zero condition that one would only know having read the USB standards documents, which at time of writing I did not have copies of, and have the sneaky suspicion may not be freely available. I also picked up a Microchip MCP2221A (Farnell 2678459) but on the controlling PC an application would have to implement a communication protocol with the MCP2221A rather than reading/writing RS232 bytes directly. 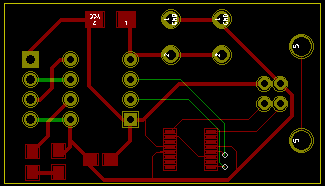 Getting this PCB working was much more difficult than it should have been, having sent three revisions for fabriction. In total I ordered nine PCBs, six of which I at least partially soldered, and in the end only two of them worked properly if at all. I thought this would be a simple circuit, but considering how few actual components it had and that most of them I had used before, it was something of an ordeal. Many of the PCBs I soldered up just had the USB socket and the UART interface chip in place, and whether Linux would recognise the device or not was temperamental at best. At first I thought it as dodgy connections, but in the end I concluded it was a dodgy batch of interface chips, because all the malfunctioning PCBs had one thing in common: They all had units with a manufacturing date code of 1729-D, whereas the chip used for the prototype had 1714-D — the latter was from an earlier order of just three chips. The two stocks were stored in the same folder sleeve, so I doubt it is any fault with handling. on my part. I have not used surface-mount LEDs before, but other than difficulty seeing the polarity marking, was no different to hand-soldering capacitors and resistors. I used an Osram Red LED (LSR976, Farnell 1226392) since it was of the right size and I had it in stock. The LED was rated as 25mA, but I decided that I wanted it to draw only 5mA at most — the LED had a reported voltage drop of 2V, so being a 5-volt circuit I aimed to have a protective resistance of at least 600&ohm;. Since the nearest ones I had to this rating of the correct physical size (0805/2012) were 560&ohm; and 820&ohm; I opted for the latter. The LED seemed quite bright considering it was rated at 25mA and I was giving it only 3-4mA. The design included a decoupling capacitor from the outset, but what surprised me was that the PIC12F1822 did not work at all until it was installed. It is unusual these days for me to omit such capacitors, but I have used this micro-controller without them in the past in similar setups involving I2C and RS232. Suppose in the past the capacitance within the circuit itself was enough, so it has not caught me out before. An overrun is when the requested data byte counts is larger than what the internal buffer can accommodate. A restart address nack is when a nack is received in response to the slave address after the I2C Restart in a read transactions that includes register addresses — this is because such transactions are a combined write and read, which involve the master sending the slave device address twice, and a failure with the second sending of the address is a problem other than the address possibly just being incorrect. Since this PCB is intended as a replacement for the USB-ISS I used in the past, I modified my original Python test program and this modified version is included within Bitbucket. The command-line reflects the serial protocol, and the following templates show typical usage. A notable change compared to the control script for the USB-ISS is that while read requests still need to specify the number of bytes to read from a slave device, the number of bytes the script itself reads from the adapter is handled automatically. The serial port requires a BAUD rate of 57,600 which is set by the control script. You may also need to set read/write permissions on /dev/ttyUSBx as quite often serial devices are not attached with global access. It took far longer than I intended, but I finally have a production USB-I2C master of my own making, which will be used as reference for any future I2C-related electronics projects I do. The Robot Electronics USB-ISS has served me well, but on the whole I feel it no longer fits my requirements, in particular having issues with some components. 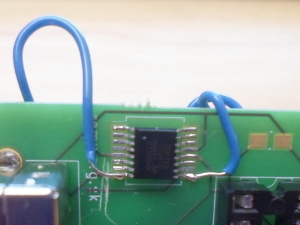 Although there is still room for improvement, in particular how it responds when the I2C lines are not connected, a major goal in making my own adapter was exposing more internal state for debugging purposes.